Like all organs in the body, the heart needs a constant supply of blood. This is supplied by the coronary arteries. In older people, these arteries can become narrowed and hardened (known as atherosclerosis), which can cause coronary heart disease. If the flow of blood to the heart becomes restricted, it can lead to chest pain known as angina, which is usually triggered by physical activity or stress. 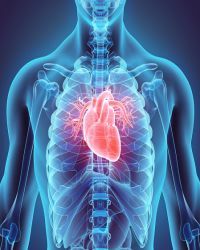 While angina can often be treated with medication, a coronary angioplasty may be required to restore the blood supply to the heart in severe cases where medication is ineffective. 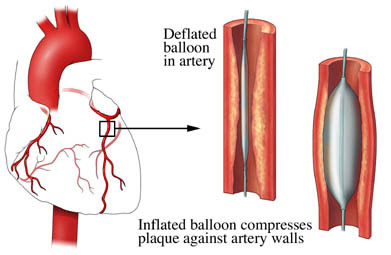 Coronary angioplasties are also often used as an emergency treatment after a heart attack. In most cases, the blood flow through the coronary arteries improves after an angioplasty. Many people find their symptoms get significantly better and they’re able to do more than they could before the procedure. If you've had a heart attack, an angioplasty can increase your chances of surviving more than clot-busting medication (thrombolysis). The procedure can also reduce your chances of having another heart attack in the future. Please contact medinovita team for detailed quote & rates. Thoracoscopic surgery (VATS) is a minimally invasive surgical technique used to diagnose and treat problems in your chest.In thoracoscopy, a thin, flexible viewing tube (called a thoracoscope) is inserted through a small incision in the chest. Fiberoptic cables permit the surgeon to visually inspect the lungs, mediastinum (the area between the lungs), and pleura (the membrane covering the lungs and lining the chest cavity). In addition, surgical instruments may be inserted through other small incisions in the chest, to perform both diagnostic and therapeutic procedures. Compared with open surgery, less-invasive options such as VATS and robotic surgery result in reduced postoperative discomfort and quicker patient recovery. In turn, patients stay fewer days in the hospital and return to normal activities, including work, sooner. How does video-assisted thoracoscopic surgery (VATS) work? The surgeon makes two or three small cuts (incisions) in the chest wall near the ribs. These holes are known as ports and are usually about 2 cm long. 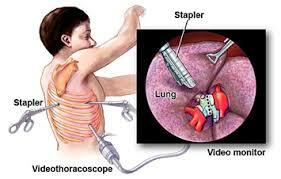 The surgeon then inserts the thoracoscope through one hole. The thorascope allows the surgeon to see inside the chest. Usually he/she will also insert special surgical instruments into the other incisions. These instruments can be used to remove tissue which may have been seen on an X-ray, or fluid found in the chest. Once the surgery has finished, the instruments are removed and the incisions are closed, usually with stitches. What happens during video-assisted thoracoscopic surgery (VATS)? VATS is carried out in the operating theatre. Before the procedure, a small needle will be placed in a vein to give you fluids and medications. It is usually done using a general anaesthetic, which means you will be asleep for the surgery. You may also have an epidural. An epidural is a form of pain relief given through a thin tube placed into your back. Once you are asleep you may have a catheter put into your bladder. This is a thin, flexible tube that is inserted into the hole through which you urinate (your urethra) and then advanced into your bladder. This is because the epidural will make it difficult to urinate by yourself. It also allows doctors to measure how much urine you are making. You will be placed on the operating table on your side. Your surgeon will make the cuts (incisions) in your chest and insert the thoracoscope and any other instruments that are needed. After the surgeon has finished the surgery he/she will insert some small tubes into the chest. These are known as 'chest drains' and allow any fluid or air that collects to leak out. Any samples of tissue taken from your chest or lungs will be sent to the laboratory for further testing. You will slowly be allowed to come around from the anaesthetic. Usually you are given oxygen through a mask. After a while you will be taken back to the ward to rest. The epidural usually stays in until the chest drains are taken out and you are able to take pain relief tablets. Occasionally, although it was planned to use VATS, it is not possible to carry out your operation using keyhole surgery. This means another technique may need to be used. Your doctor should discuss this with you before the procedure. Cardiothoracic surgery (also known as thoracic surgery) is the field of medicine involved in surgical treatment of organs inside the thorax (the chest)-generally treatment of conditions of the heart (heart disease) and lungs (lung disease). Heart valve surgery is a procedure to treat heart valve disease. 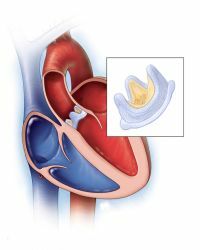 In heart valve disease, at least one of the four heart valves that keep blood flowing in the correct direction through your heart doesn't function properly.Sometimes the valve can be repaired, however if this is not feasible, then the surgeon will advise that a full replacement of the valve is necessary. Severe valve damage means the valve must be replaced and most often involves the aortic or mitral valve. It is also used to treat any valve disease that is life-threatening. Some patients may need more than one valve repaired or replaced. Two kinds of valves can be used for replacement: Mechanical valves are usually made from materials such as plastic, carbon, or metal. Mechanical valves are strong, and they last a long time. Because blood tends to stick to mechanical valves and create blood clots, patients with these valves will need to take blood-thinning medicines (called anticoagulants) for the rest of their lives. Biological valves are made from animal tissue (called a xenograft) or taken from the human tissue of a donated heart (called an allograft or homograft). Sometimes, a patient’s own tissue can be used for valve replacement (called an autograft). Patients with biological valves usually do not need to take blood-thinning medicines. These valves are not as strong as mechanical valves, though, and they may need to be replaced every 10 years or so. Biological valves break down even faster in children and young adults, so these valves are used most often in elderly patients. 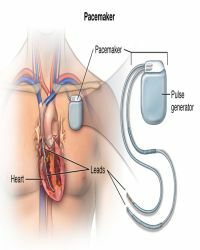 A pacemaker insertion is the implantation of a small electronic device that is usually placed in the chest (just below the collarbone) to help regulate slow electrical problems with the heart. A pacemaker may be recommended to ensure that the heartbeat does not slow to a dangerously low rate.A pacemaker may be needed when problems occur with the electrical conduction system of the heart or when the timing of the electrical stimulation of the heart to the heart muscle and the subsequent response of the heart's pumping chambers is altered. Most pacemaker implantations are done using local anesthesia to numb the area of any incisions.The implantation is done in a room with special X-ray equipment. Your chest is cleaned with an antibacterial soap, and an IV line is placed in your arm on the same side as the pacemaker.During surgery, one or more flexible, insulated wires (leads, or electrodes) are inserted into a major vein under or near your collarbone and guided to your heart with the help of X-ray images. One end of each wire is secured to the appropriate position in your heart, while the other end is attached to the pulse generator, which is usually implanted under the skin beneath your collarbone. After the procedure before the patient leave,pacemaker is programmed to fit patient's particular pacing needs.Also patient is advised to avoid vigorous exercise or heavy lifting for about a month.